Vapor Equilibrium is a single channel video. Through the form of essay, the work depicts the people’s desire to produce images in our time, the images and social spaces interpenetration and co-construction, and the belief in cloud computation. The work navigates in between the reality constructed by technological, sensible, and perceivable aesthetics. And they are channeled through a personal essay to illustrate the relationship between image and data re/production and the environment. From social media, entaintaning industry, selfie culture, cloud storage, rare-earth mining, to air pollution, these elements support or against each other in a fictional narrative created by this work. “All a sudden, the cloud is everywhere”, in the video, the descent of the cloud is as rapid and unforeseen as the sublimation. When massive among of image and data has been generated, copied and uploaded, the overloaded cloud descents to our surroundings. When human pursue an absolute visibility in digital space, the industrial particulate matter immediately responds with a fully visible, ubiquitous opaque. In the interpenetrative chaos of image, data, human, and environment, and in the reality co-constructed by the technological and sensible real, the preexisted solidity is long gone. We are facing some ever-transit liquidity. However, this work tries to heat up the condition to gaseity. 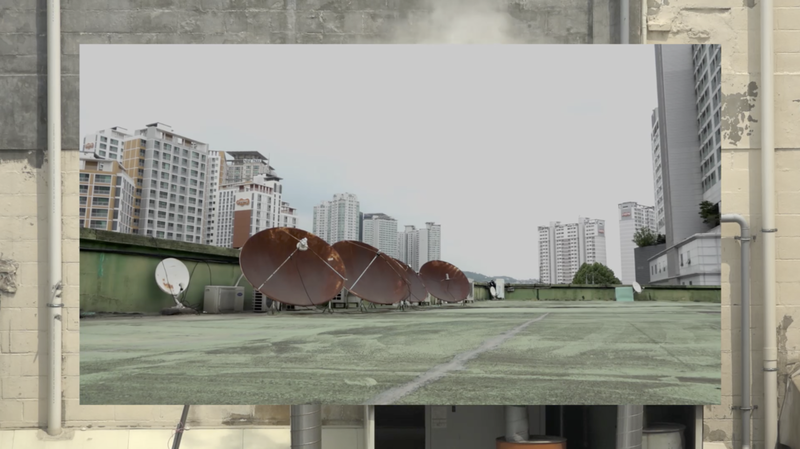 Through observing the clouds, the video uses meteorology to unpack and analyse how sociopolitical, industrial, and entertaining climates affects the landscapes we dwell in.